The playing area is divided into end zone – intermediate zone – middle zone – intermediate zone – end zone. Each team defends one end zone and has a goalkeeper to guard the big goal. The middle zone is occupied by 3 players of each team and two neutrals on the sidelines (maximum 2 touches for them). In the intermediate zones, there are 2 defenders and 1 attacker on the line next to the end zone as well as 2 attackers in the triangles on the sides. The game always starts in the middle zone. Playing in a 5(3+2)v3, the team in possession needs to complete 5 countable passes, before they can start to attack the opponents’ goal. Countable passes are defined as diagonal passes between the zones or a horizontal/vertical pass that skips a zone. Once the number of passes is achieved, the attacking team can leave the middle zone through passing to a striker in the intermediate zone. Alternatively, the pass can also be played to a player pushing up from the middle zone. In this case the line between middle and intermediate zone becomes the offside line. Once the last pass from the middle zone is played, the intermediate zone is opened and all players on this side of the field become active without being restricted to their line/zones anymore. From this moment on, there’s a free game in a 6v5 (players from middle zone plus players from intermediate zone) with a time limit of 10 to 15 seconds. The 2 neutral players position themselves in the middle zone, immediately, to be an instant passing option for the defending team after winning the ball. The attack ends, when a goal is cored, the ball goes out of bounds, the goalkeeper secures possession, a defender passes to one of the neutrals, after a foul/offside or once the time runs out. At the same time, the coach passes to an attacker in the opposite intermediate zone and a separate attack is played (5 to 8 seconds) in a 32. The base of this training game is a 4-3-3 with a central focus and the main attention directed to the team in possession. The version presented above already is a progression of a simpler drill. 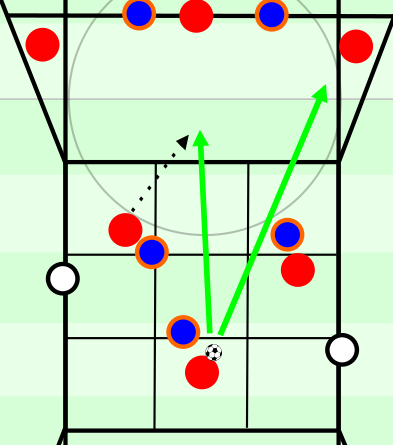 Initially it was only about the game in the middle zone, which was played as a positional rondo without playing direction. The team with the highest “pass combo” (countable passes in one possession) would win. In the middle zone, the players should be guided towards a better positioning in relation to space and team mates. The rule of countable passes forces them to play the desired diagonal or longer passes. The neutrals are crucial in providing width for the team in possession and should ideally be full-backs or wing-backs). At the same time, they function as overload players and are the ones that can open the center. At this stage, we mainly coach body position, pre-orientation (also towards intermediate zone), follow-up actions and verbal/nonverbal communication between the players. The pass into the intermediate zone releases the attack and changes the rhythm of the possession game accordingly. We generally use triggers like a central player/half-space striker receiving the ball with an open body position or a lay-off within the space between the lines, e.g. striker to half-space striker or half-space striker to central midfielder. The temporary offside line when passing to a central player advancing from the central zone teaches proper timing and dynamic for the ball receiver. The time limit supports direct play towards the goal. At the same time, the danger of a defender winning the ball and passing to a neutral player provokes counterpressing moments to stop the counter from an advanced position. It’s generally important to finish off an attack at this stage. The importance of this is actively emphasized. With the abovementioned rules in placed, it can happen that the supposed attacking team will be outscored by the other team within a round. Thus, the separate attack doesn’t just occupy the remaining players, but also increases the pressure to be focused in all actions and play as successful as possible to make the attack that started from the middle zone really count. Next to varying the usual parameters of the game, like number of players, passes and touches, you can also rearrange the training game for smaller spaces. On one hand, you can save a few meters by making the outside zones smaller. On the other hand, you can replace the big goal on one side with mini goals to reduce the size of the end zone. The layout of the playing area originally was a permanent tube (width of the middle zone) with the half-space strikers sticking to the outside lines of the intermediate zone. But we wanted to provide more width in advanced spaces, so we extended the zones and used the triangles for the half-space strikers.